Can a restaurant be all things to all men? Relaxed yet sophisticated, easygoing and polished, fun yet professional? Margot’s runaway success would suggest that it can. But first, a few words about the title. Margot is named after co-owner Paulo de Tarso’s diminutive mother-in-law, who now appears on the business cards in the form of a pedigree dachshund, in honour of her affectionate nickname. The owner’s pedigree is similarly flawless: former Maître ‘d of The Wolseley, Scott’s, and, most recently, Bar Boulud at The Mandarin Oriental in Knightsbridge, de Tarso opened Margot in 2016 as a joint venture with Nicolas Jaoüen. The latter is former general manager of Balthazar in Covent Garden; having worked together at Scott’s, the pair started Margot with the aim of perfecting slick yet friendly service in London. They’ve succeeded. Margot is the anthesis of a Gallic Michelin nightmare, all forced theatre, stiffness and long silences. Eating here is fun, as its supposed to be. The staff are both likeable and engaging – yet professional at all times – the atmosphere irresistibly convivial and the culinary offering ideal. 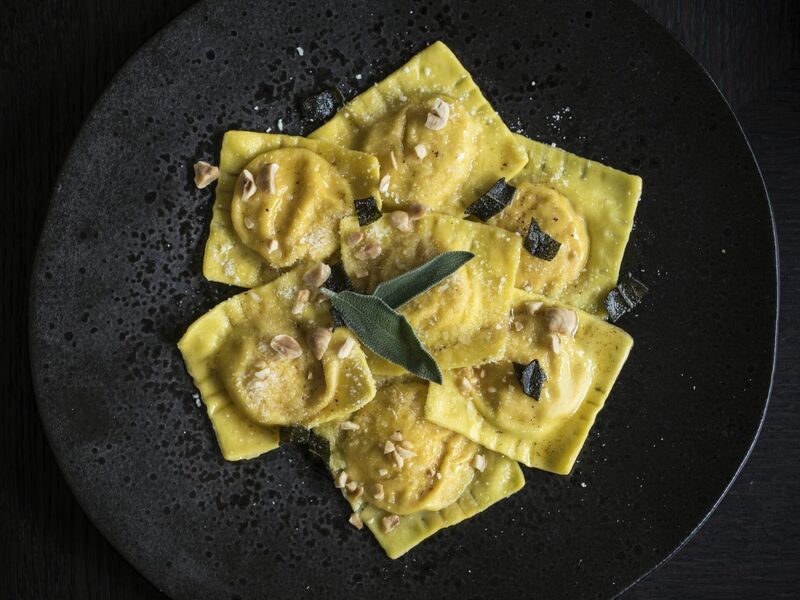 Carefully poised comfort food is what Margot is all about, overseen by Roman-born executive head chef Massimiliano Vezzi, a stalwart of several 5-star hotels in London, including The Lanesborough and The Halkin. However, the decor screams money, rather than playfulness or joie de vivre. Sleek and showy, de Tarso clearly spent a fortune making Margot look posh, all leather booths, white tablecloths and tuxedo-wearing bar staff. But this is the real beauty of the place, it manages to be refined and relaxed at the same time. Of course, all the conviviality in the world is for nothing without a surfeit of tasty morsels to back it up. Here Margot hits another home run, serving consistently excellent dishes – pasta being the standout – under the careful direction of Vezzi. I start with the ultimate cliché (after several rounds of decadent focaccia and olive oil) – pumpkin and ricotta ravioli with sage butter, roasted hazelnuts and Grana Padano cheese. Each pasta square is exquisite, a testament to how the simplest of ingredients – flour and eggs – can be coaxed into something quite heavenly. My friend’s crab linguine was no less impressive, silky smooth and “utterly moreish”, he exclaims. Mains aren’t quite as exciting, but textbook Italian classics nevertheless. Veal ossobuco is paired with saffron risotto and hits all the right notes, while roast rump of lamb with artichokes sauce, mint and Pecorino Romano tuile is a more inventive riff on the Sunday lunch favourite. Sweet and savoury flavours hold hands and dance away together. The Rosemary and garlic roast potatoes were an optional part of the feast, better still is steamed broccoli with capers. Yet we finish as we began – in gastronomic paradise. Desserts were glorious, a close contender for the undisputed highlight of the meal. Milk chocolate sphere filled with Frangelico mousse and caramelized hazelnuts defies words, but I’ll try. Moreish, decadent, rich – a mosaic of exquisite textures and sensations that competed with my companion’s cocoa eclair with caramel mousse, pistachio cream and pear ice cream. If sugar, as health professionals routinely suggest, is indeed the devil, then I’d happily go to hell for such unabashed delights. Oh, before I forget, a little about the wine. As I’ve said before in another publication, Margot’s list is both approachable and very clever; Italian classics are paired with more obscure grape varieties in an extensive, yet concise list that will leave the traditionalists floundering. Yes there’s Chianti and the ubiquitous Pinot Grigio, but also discover Franciacorta – Italy’s version of Champagne – Vermentino, and Greco di Tufo. 25 options by the glass give plenty of room to try something new, while the team are well-versed in answering questions and enthusing about favourites — another score for Margot, then. Any downsides? It’s far from cheap, I suppose, but then the owners are paying Zone 1 rents, a burden I wouldn’t wish on my worst enemy. But aside from that, this restaurant is impossible to dislike and easy to love, both in terms of food and the immensely enjoyable overall package. Perfect? No, but Margot comes very close.